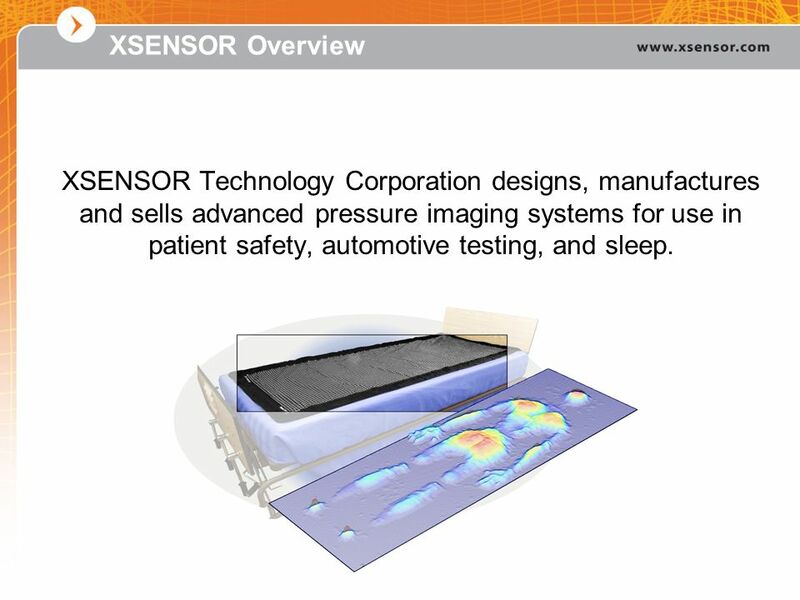 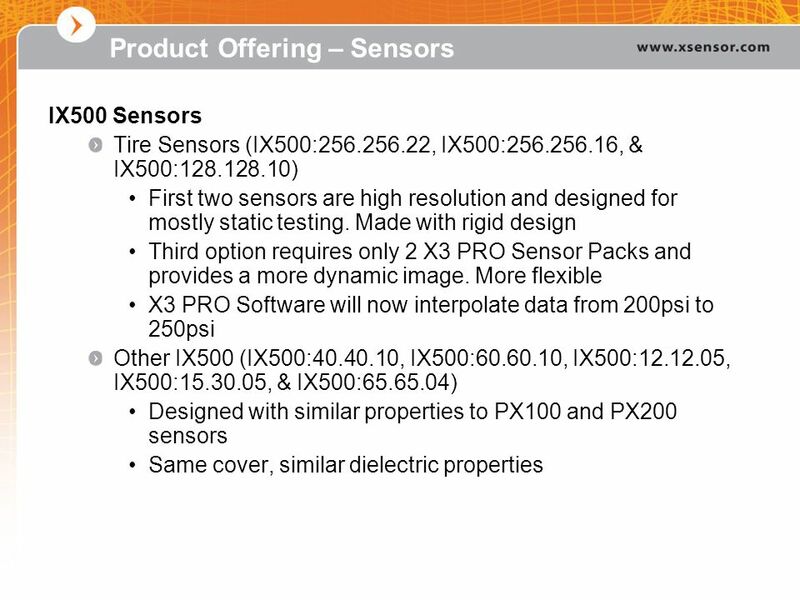 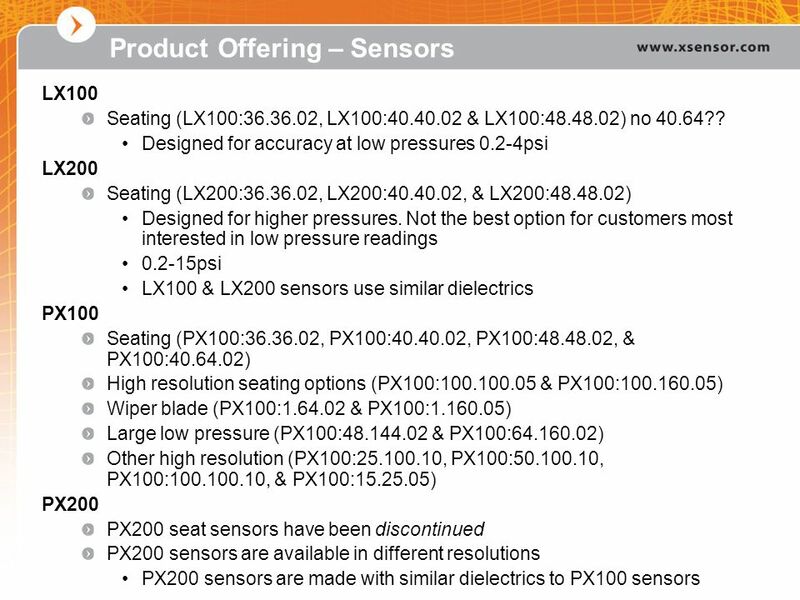 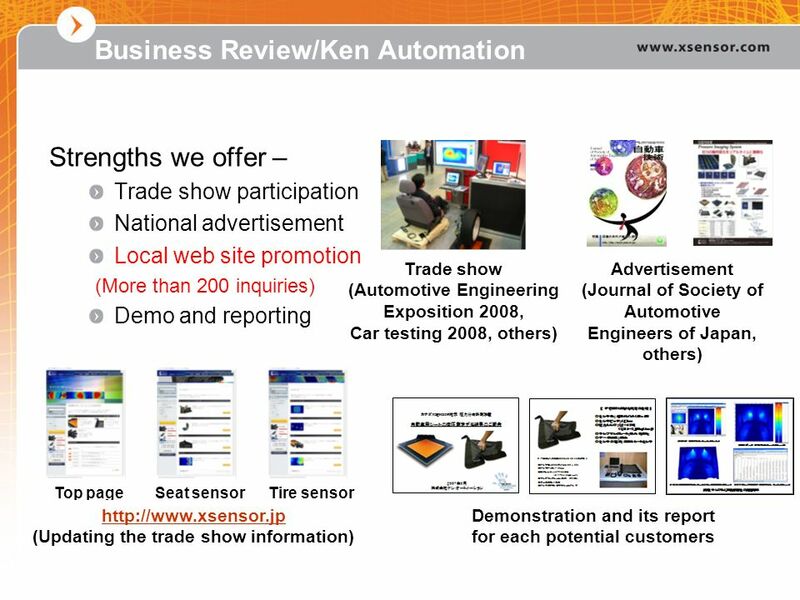 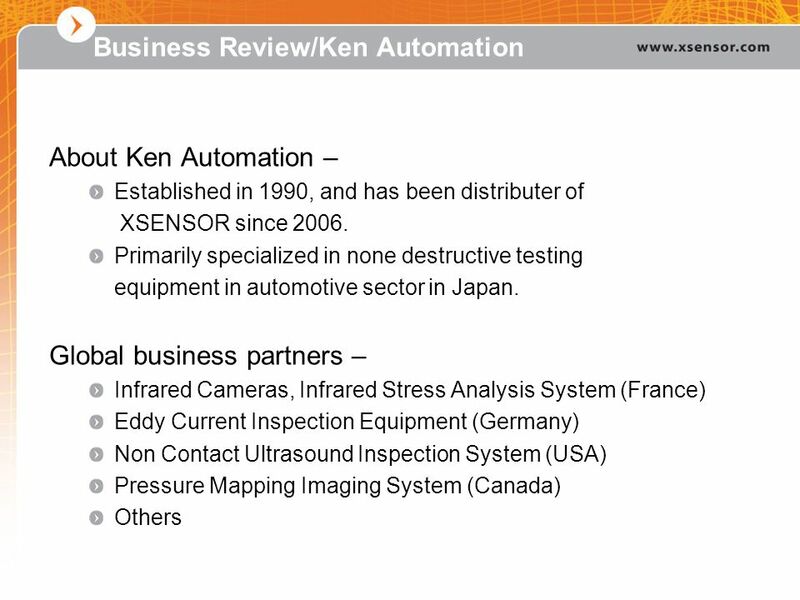 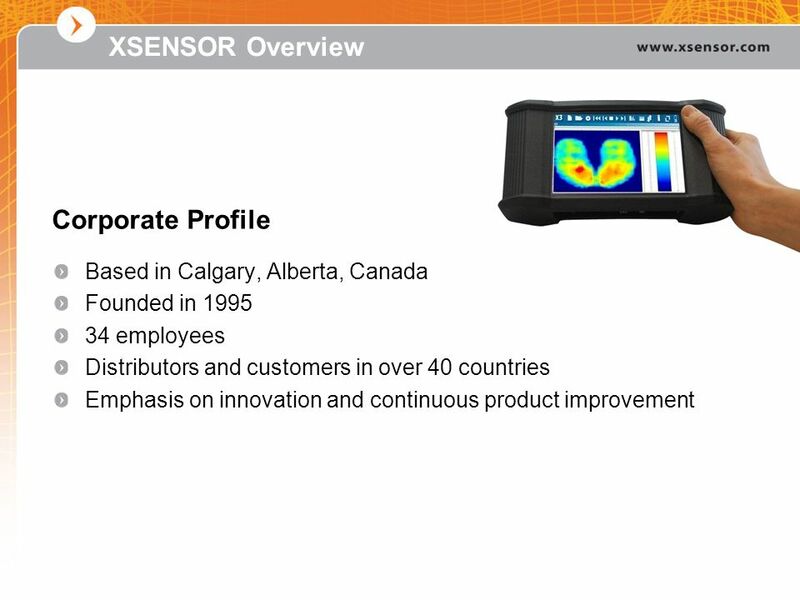 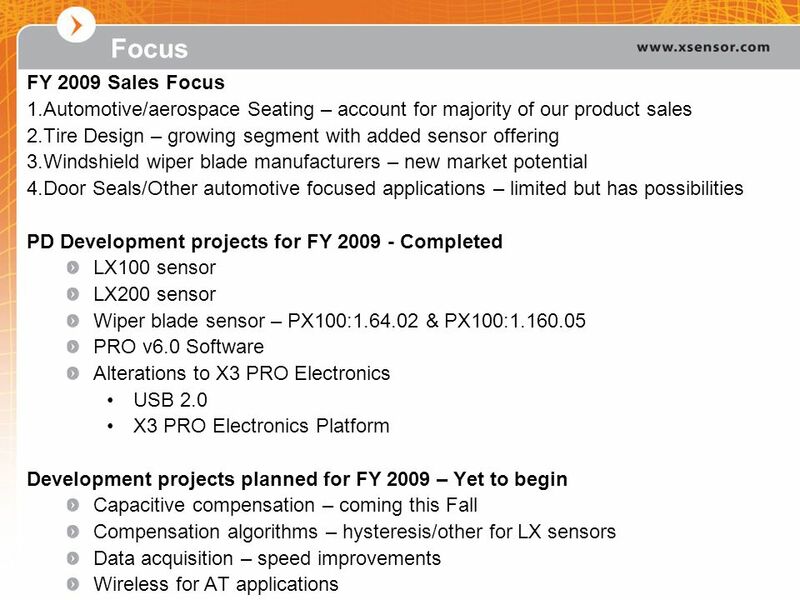 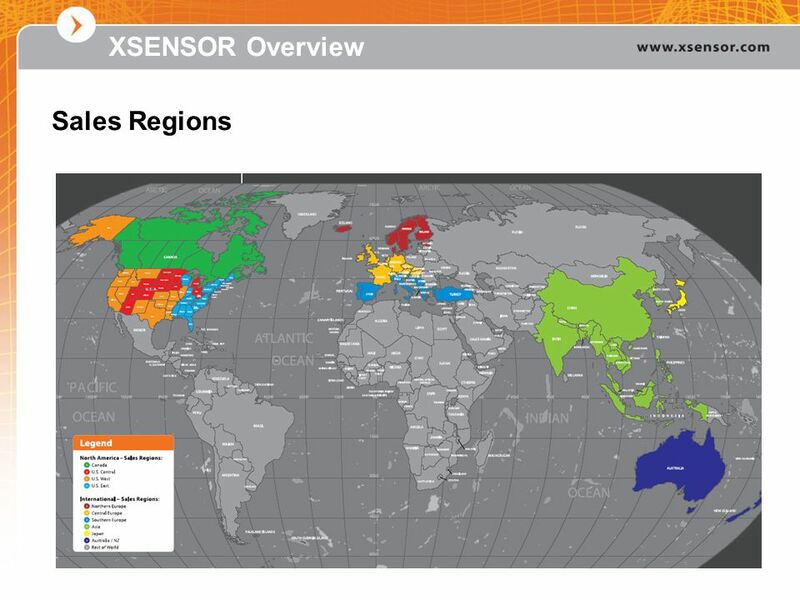 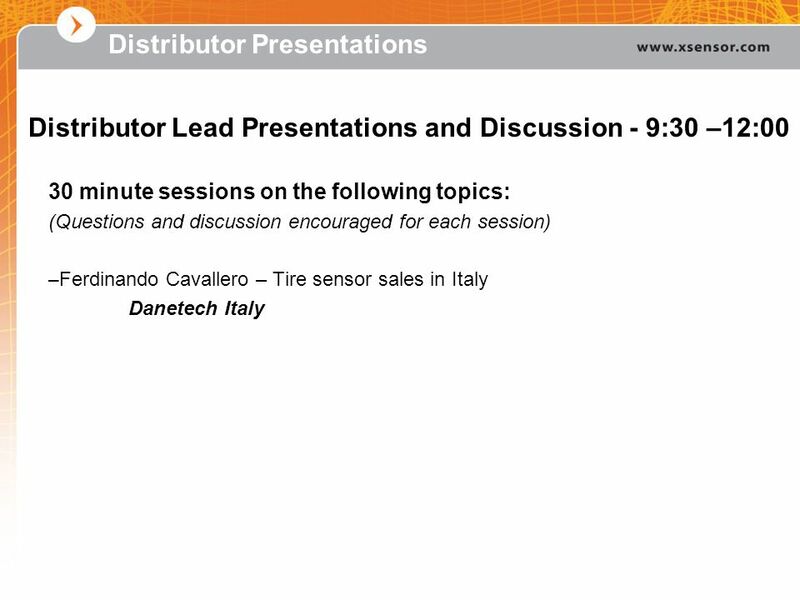 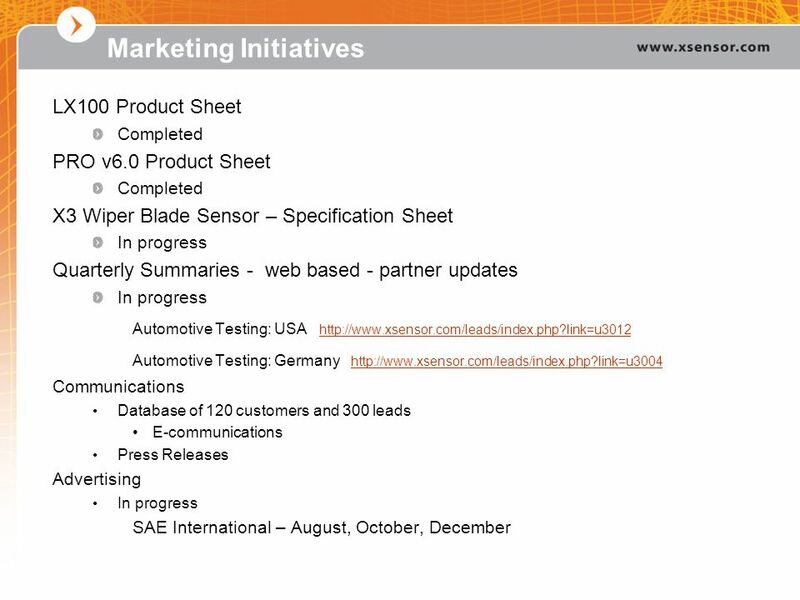 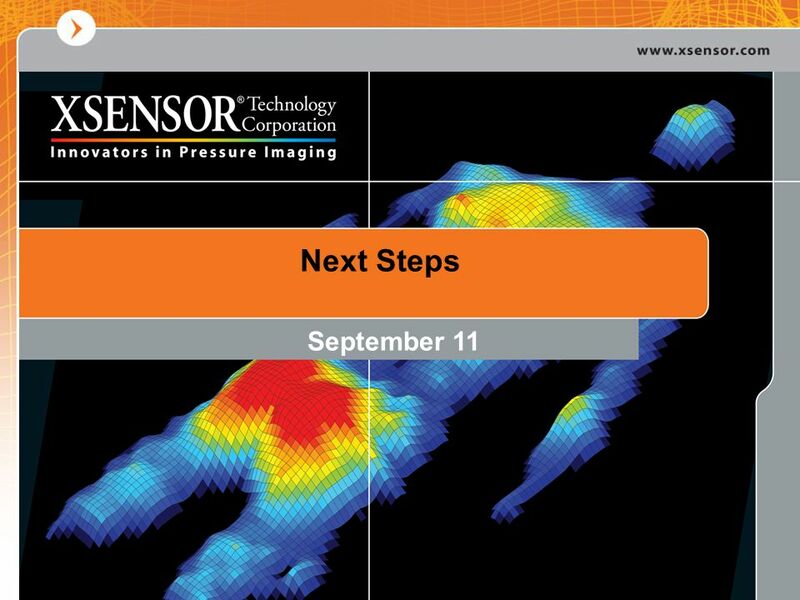 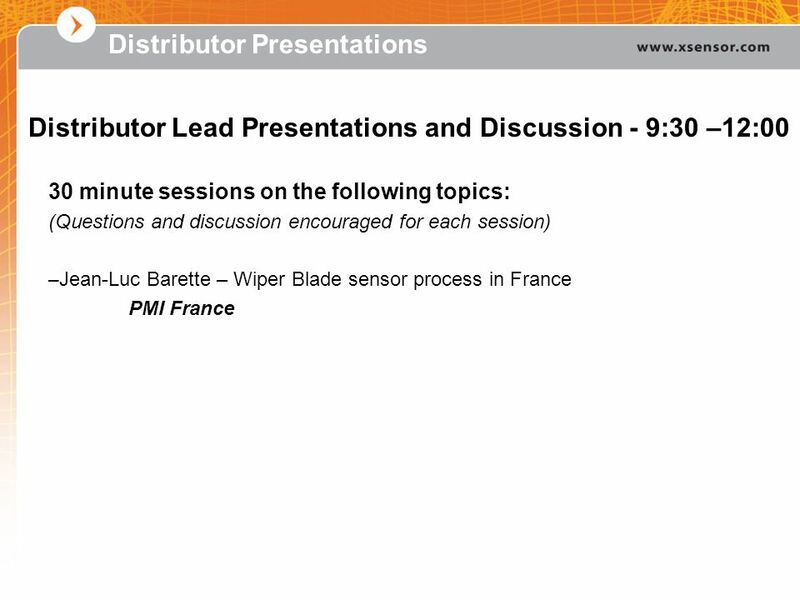 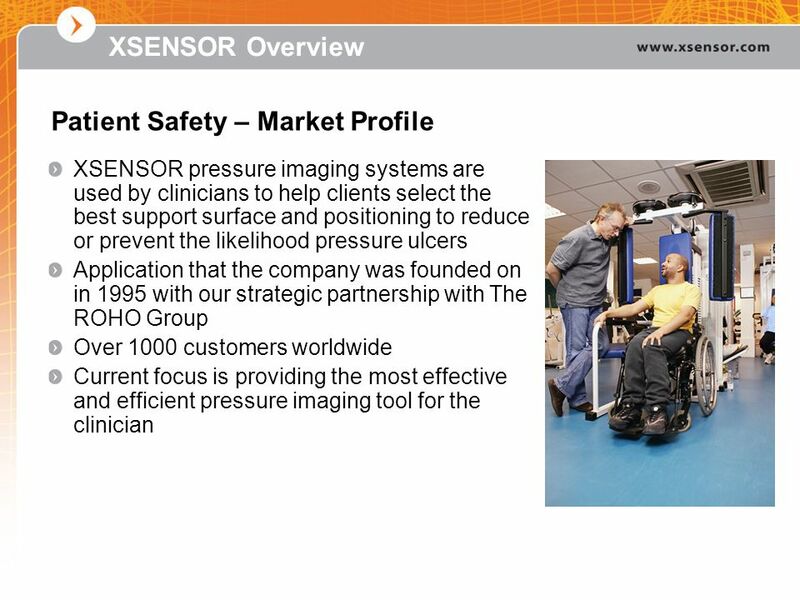 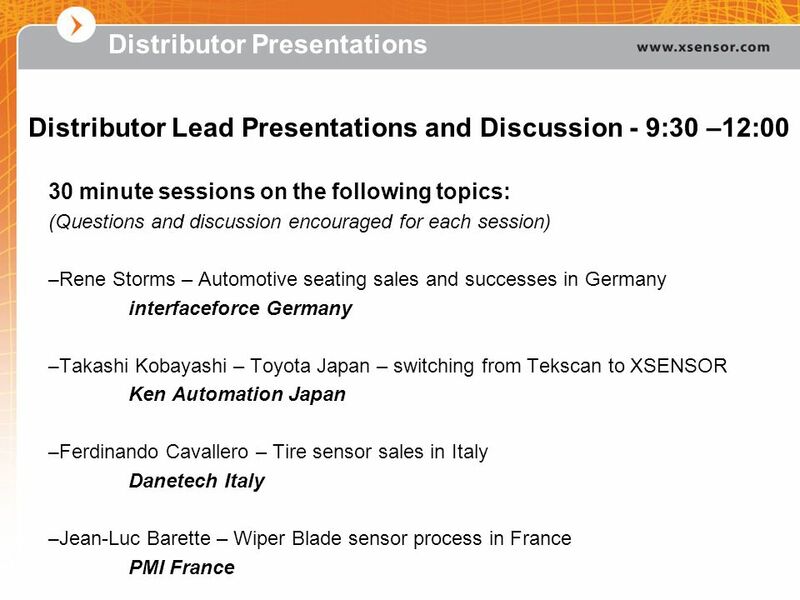 3 XSENSOR Overview XSENSOR Technology Corporation designs, manufactures and sells advanced pressure imaging systems for use in patient safety, automotive testing, and sleep. 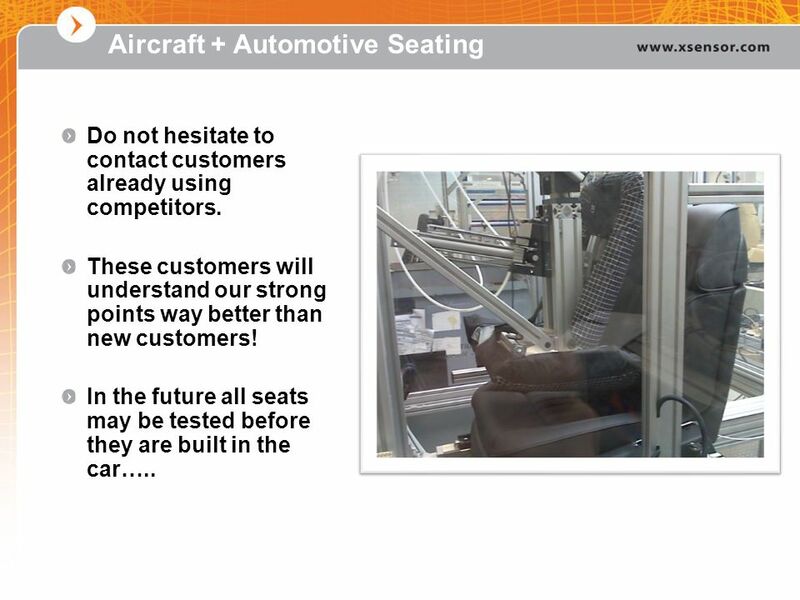 Do not hesitate to contact customers already using competitors. 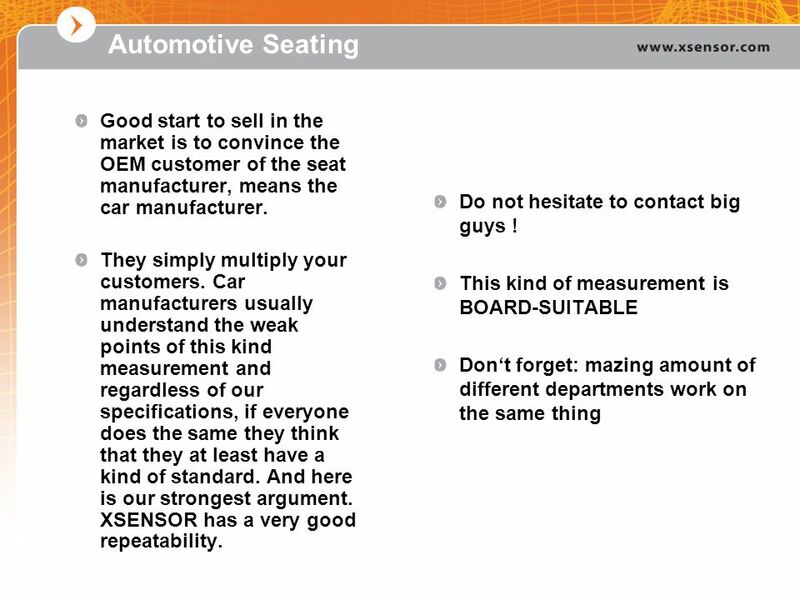 These customers will understand our strong points way better than new customers! 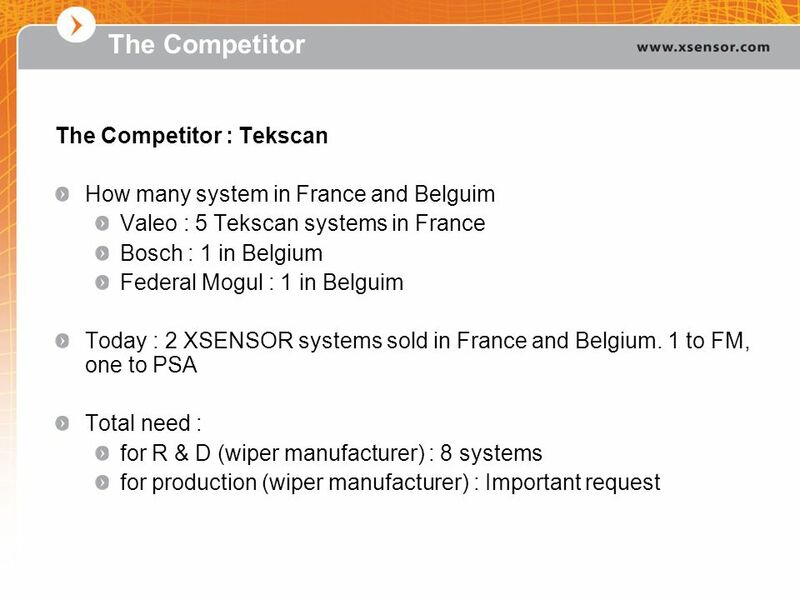 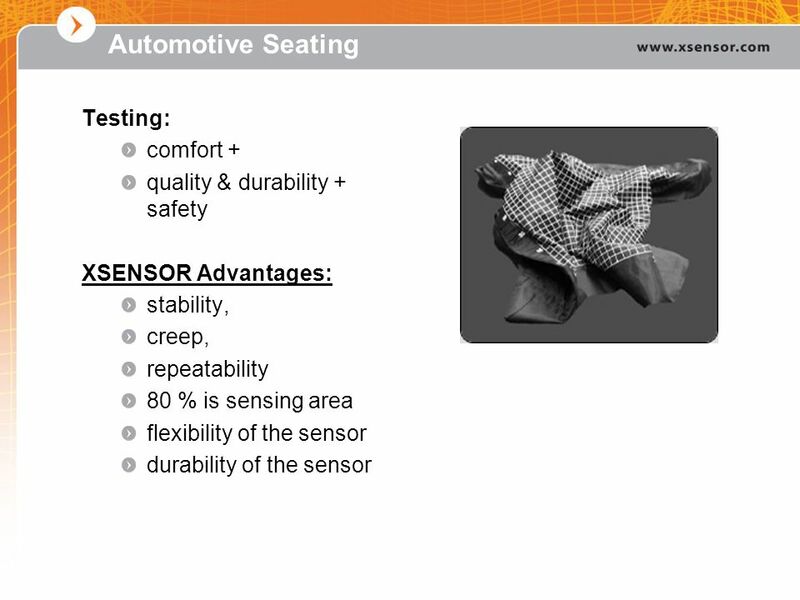 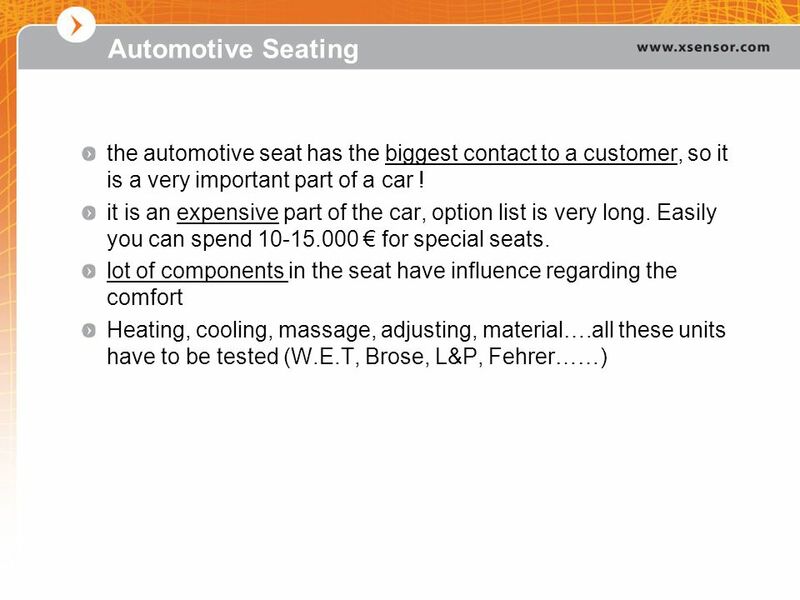 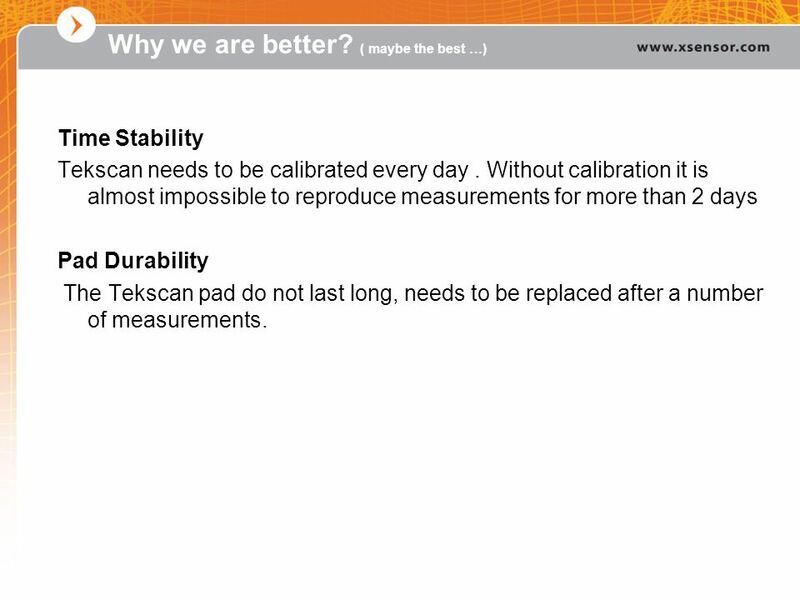 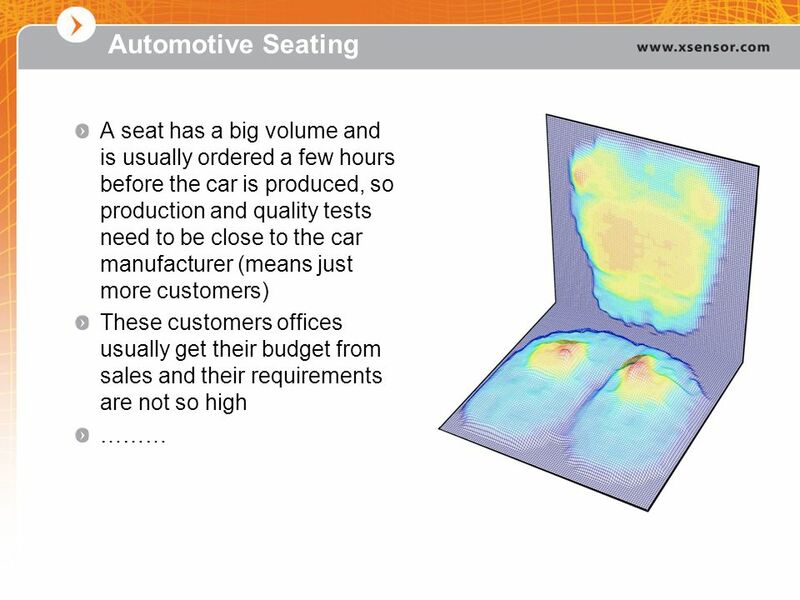 In the future all seats may be tested before they are built in the car…..
Tekscan has two sensors that are published for large Truck and Agriculture tires: model 8000Q (69 psi x 558 mm - 3 mm resolution) model 7100Q (25 psi x 914 mm - 5 x 5 mm resolution) The problem with such sensors is Price (extremely expensive) Pressure range too low Sensors are too fragile to twist and sheer forces (that are much bigger in a Agriculture - Truck and Off road tire then in a Passenger tire) FOR THESE REASONS NO ONE USED TEKSCAN FOR AGRICULTURE & LARGE TRUCK TIRES IN ITALY. 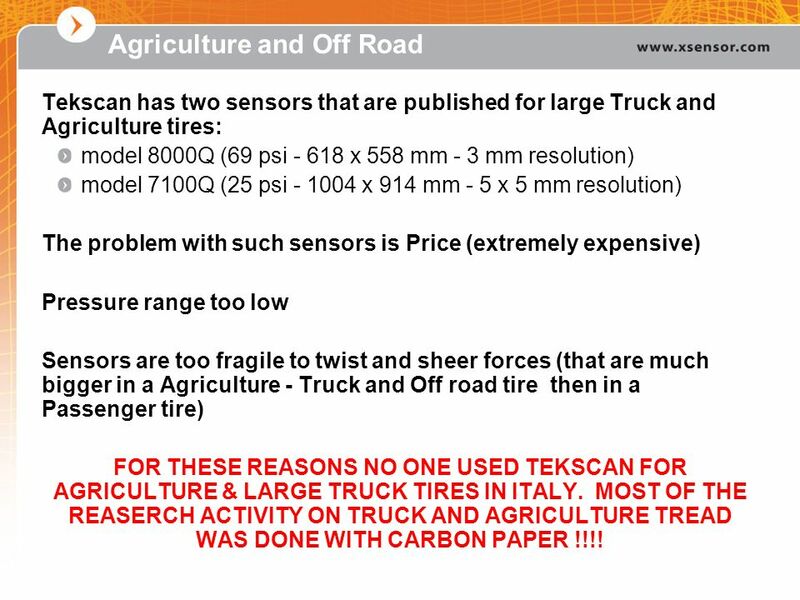 MOST OF THE REASERCH ACTIVITY ON TRUCK AND AGRICULTURE TREAD WAS DONE WITH CARBON PAPER !!!! 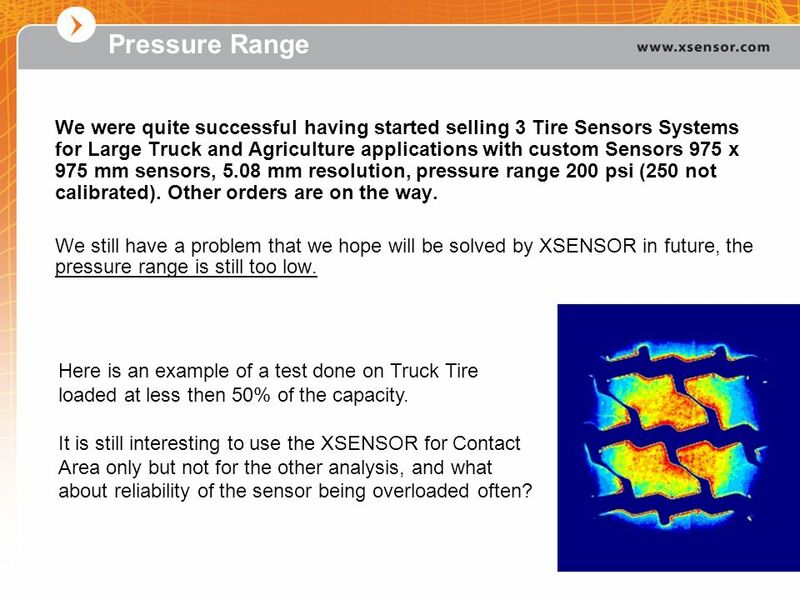 28 Pressure Range We were quite successful having started selling 3 Tire Sensors Systems for Large Truck and Agriculture applications with custom Sensors 975 x 975 mm sensors, 5.08 mm resolution, pressure range 200 psi (250 not calibrated). 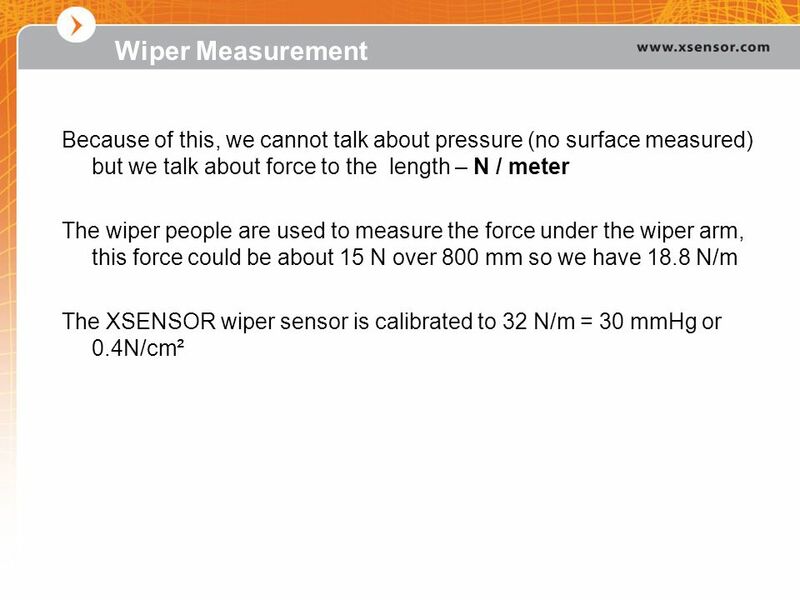 Other orders are on the way. 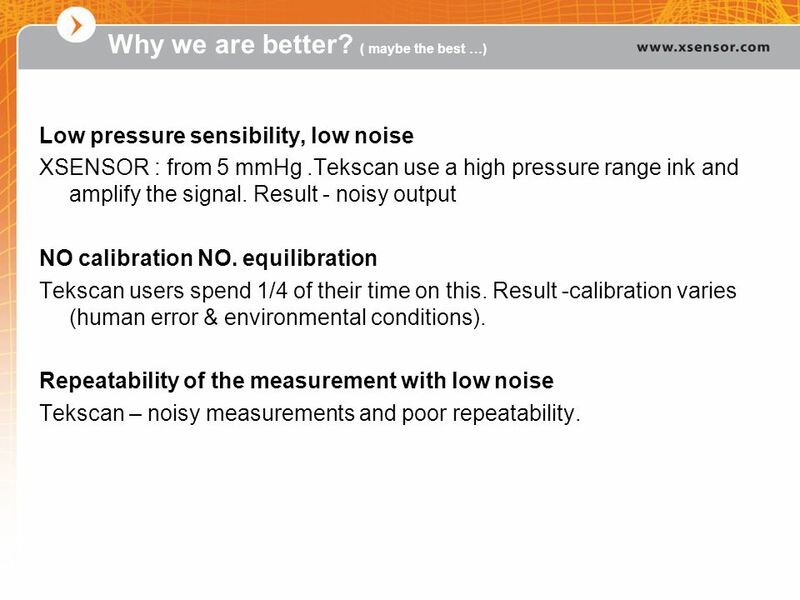 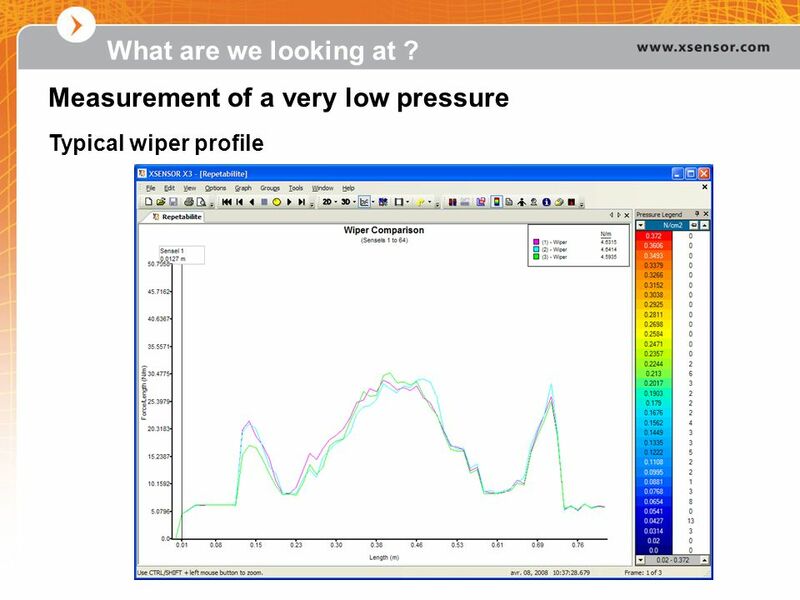 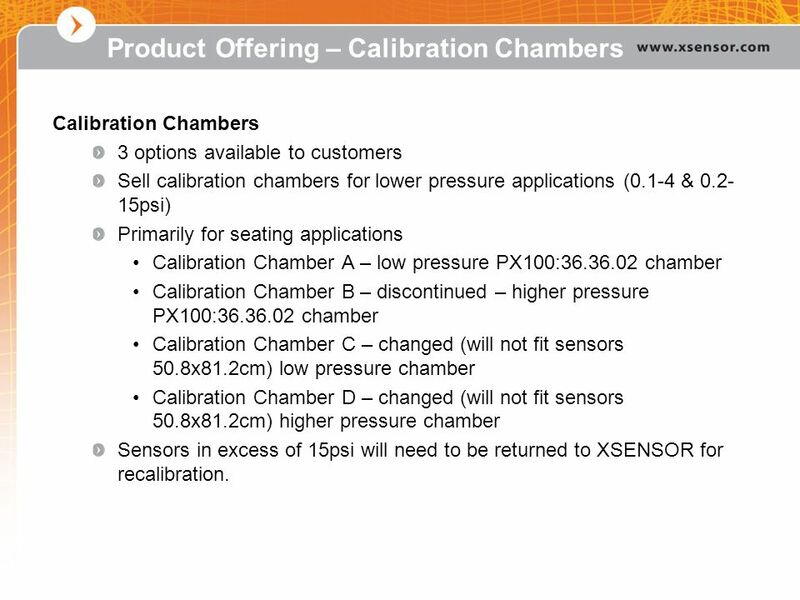 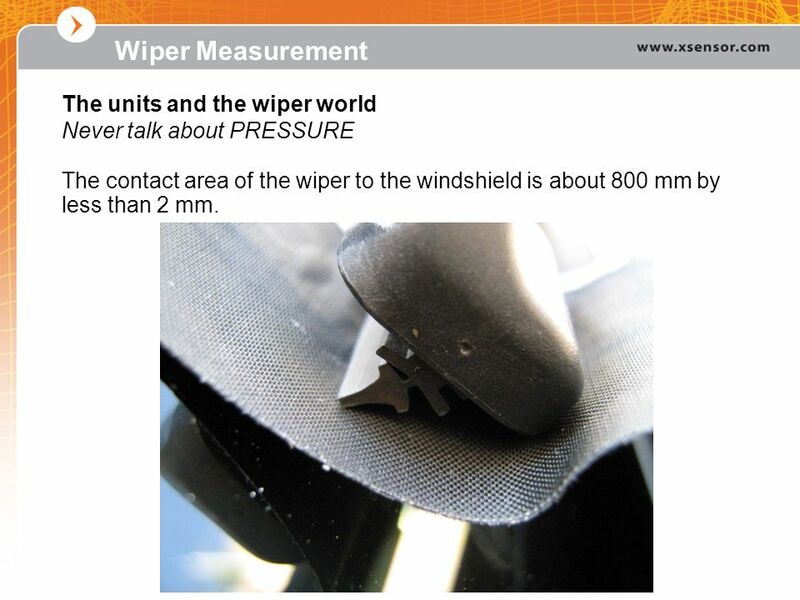 We still have a problem that we hope will be solved by XSENSOR in future, the pressure range is still too low. 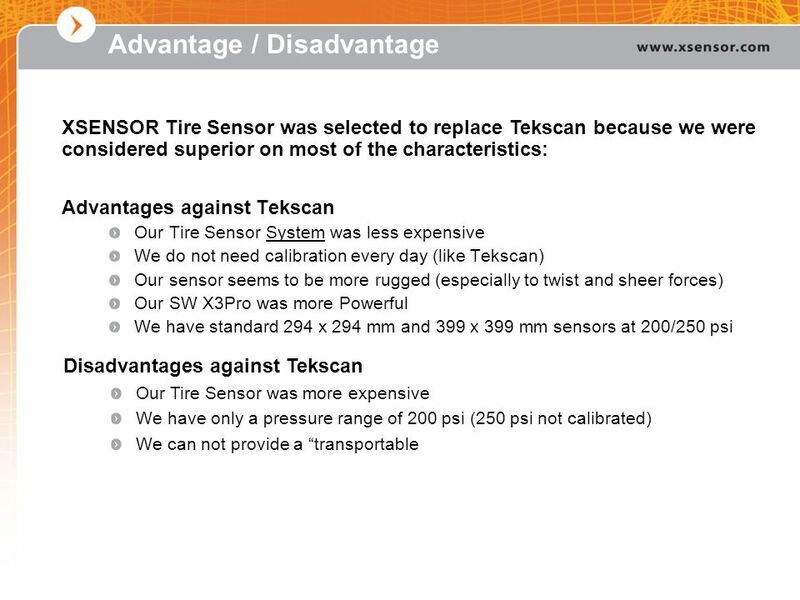 Here is an example of a test done on Truck Tire loaded at less then 50% of the capacity. 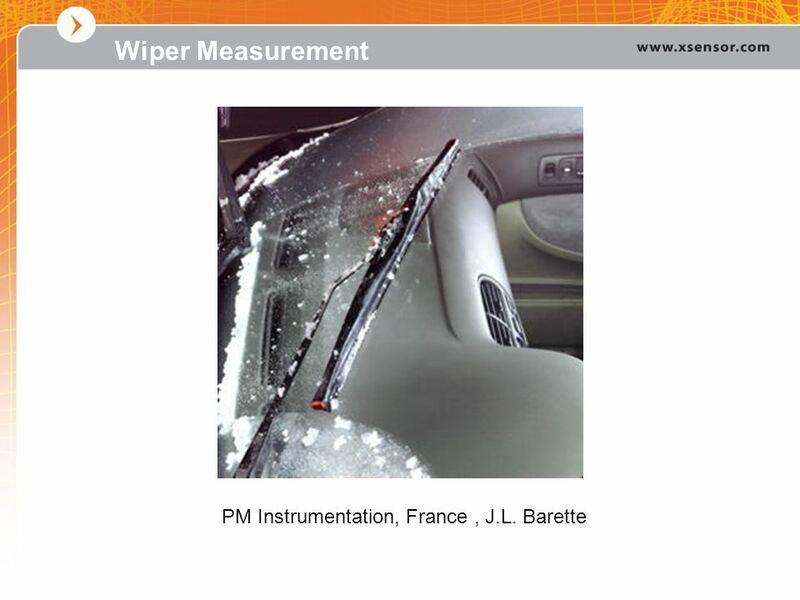 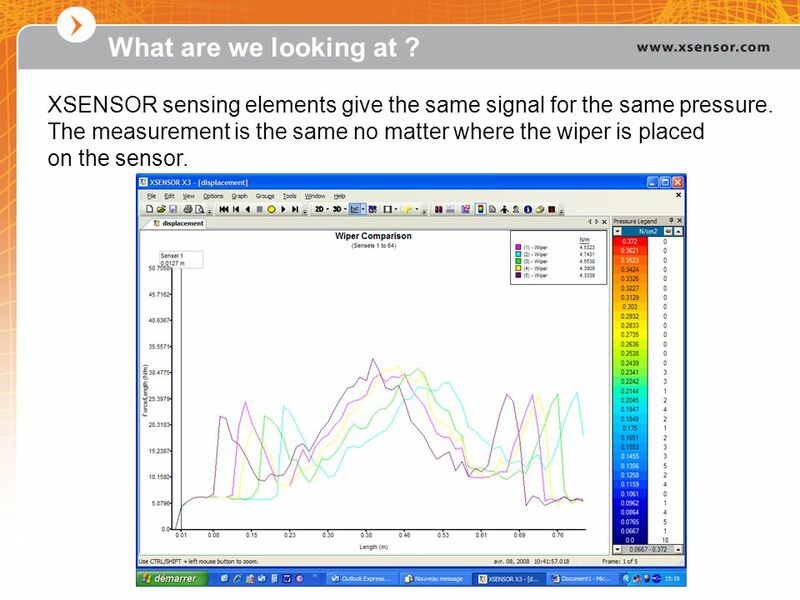 It is still interesting to use the XSENSOR for Contact Area only but not for the other analysis, and what about reliability of the sensor being overloaded often? 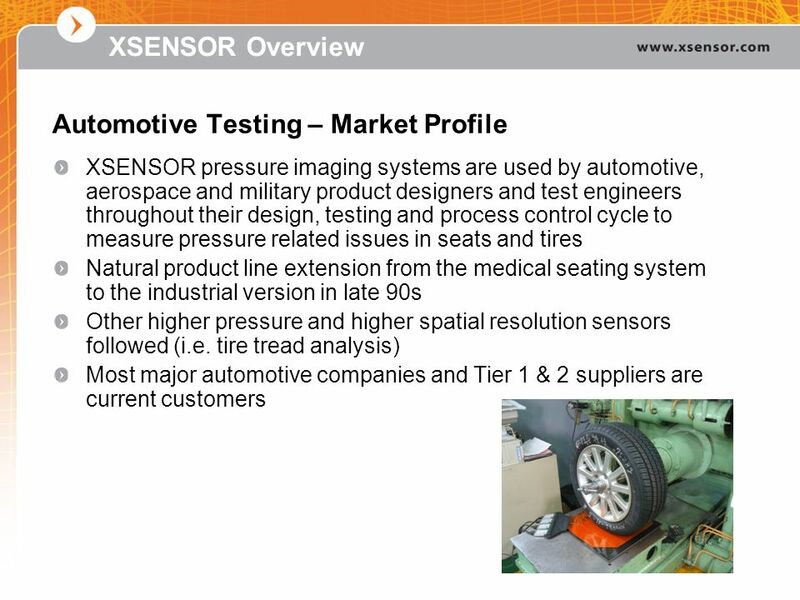 29 Subsoil Tests The manufacturers of Agriculture Tires start to consider performing subsoil tests with Pressure Plotting Systems. 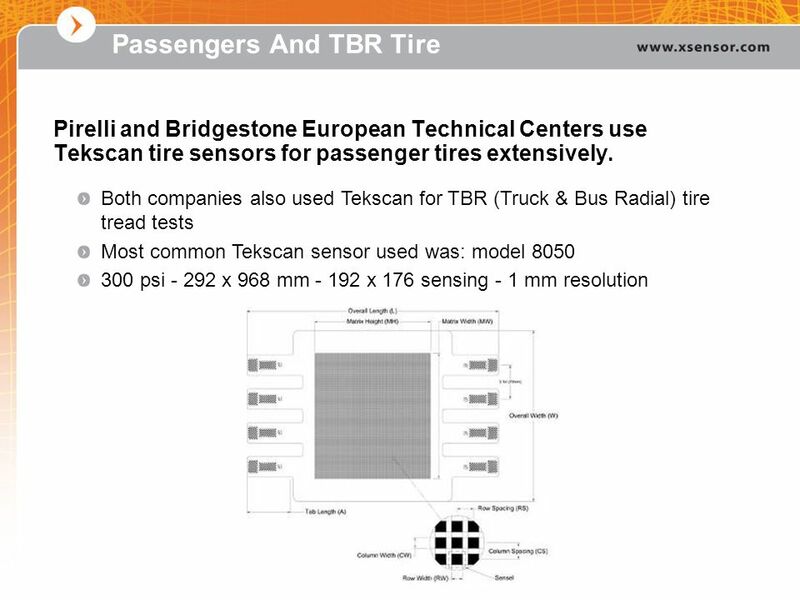 A methodology is currently under development and could became a standard test required on Agriculture Tires. 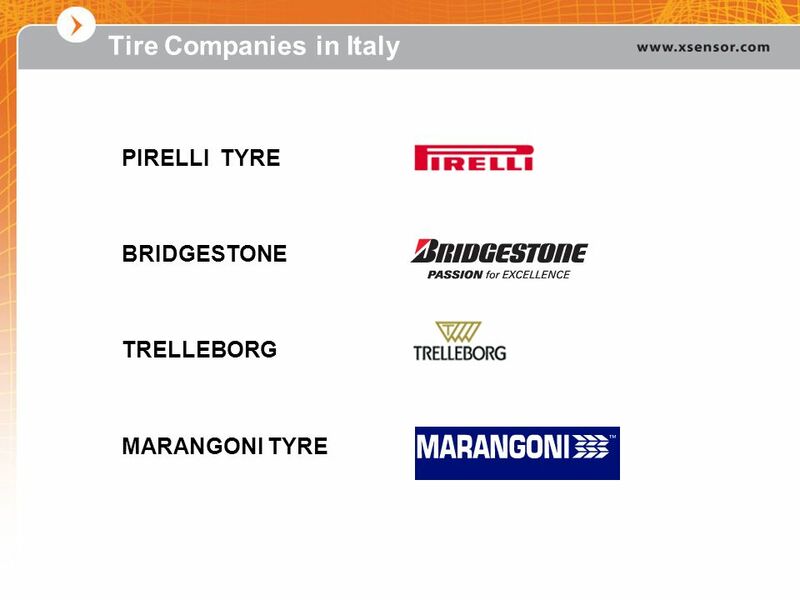 It is extremely important to promote our product to the Agriculture Tires manufacturer worldwide because the subsoil test could become a standard test (with a big potential market) and we have the “state of the art” product in this field. 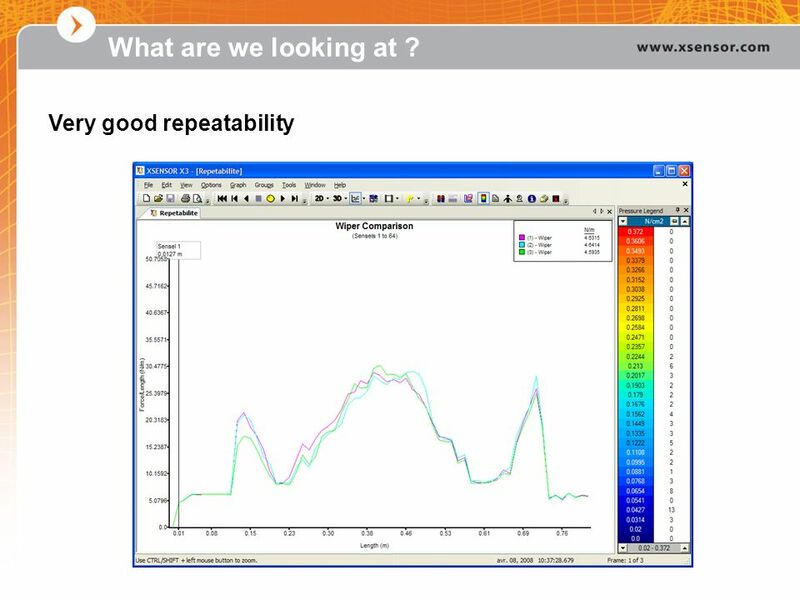 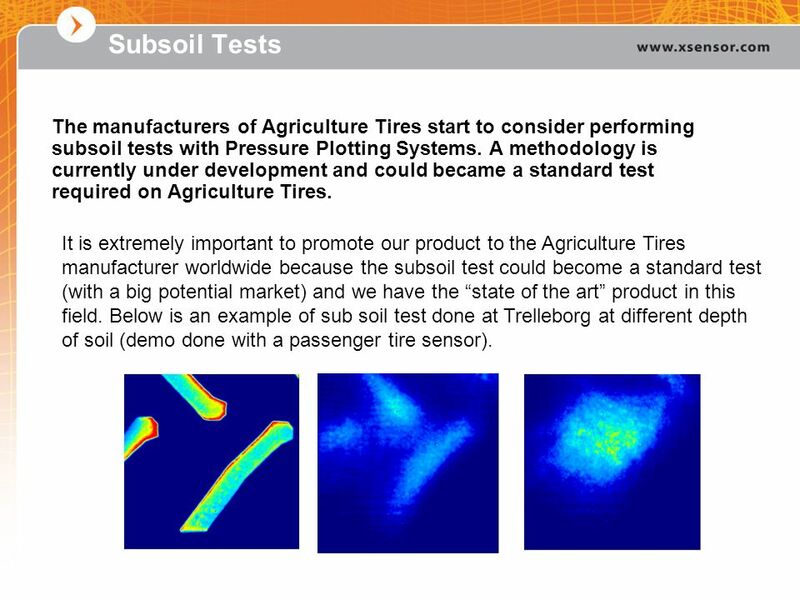 Below is an example of sub soil test done at Trelleborg at different depth of soil (demo done with a passenger tire sensor). 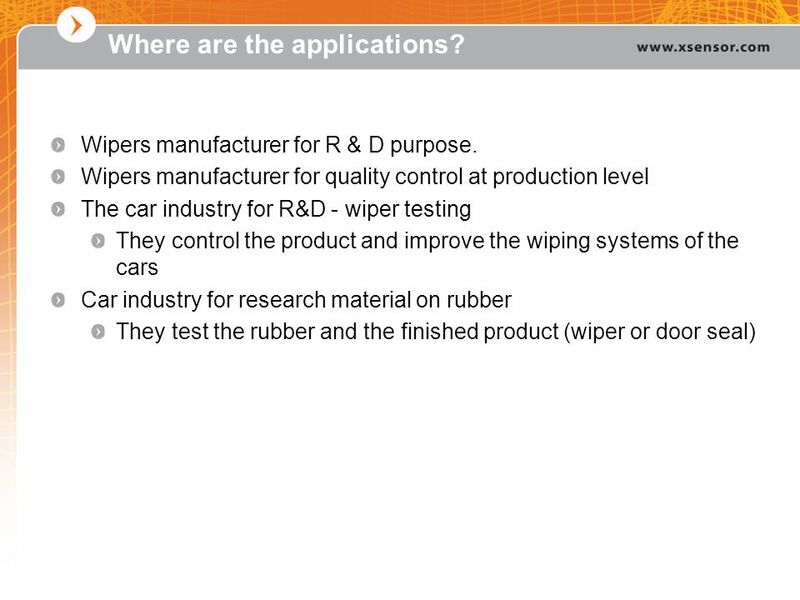 41 Where are the applications? 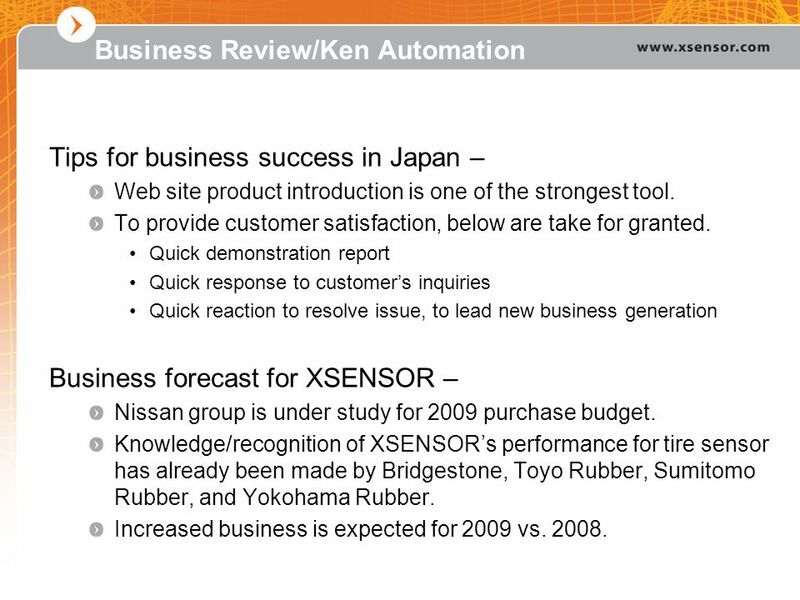 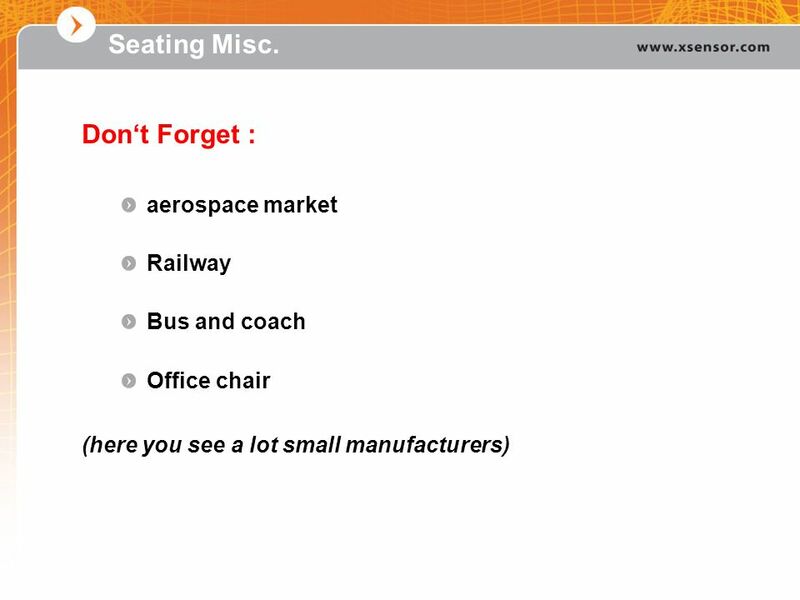 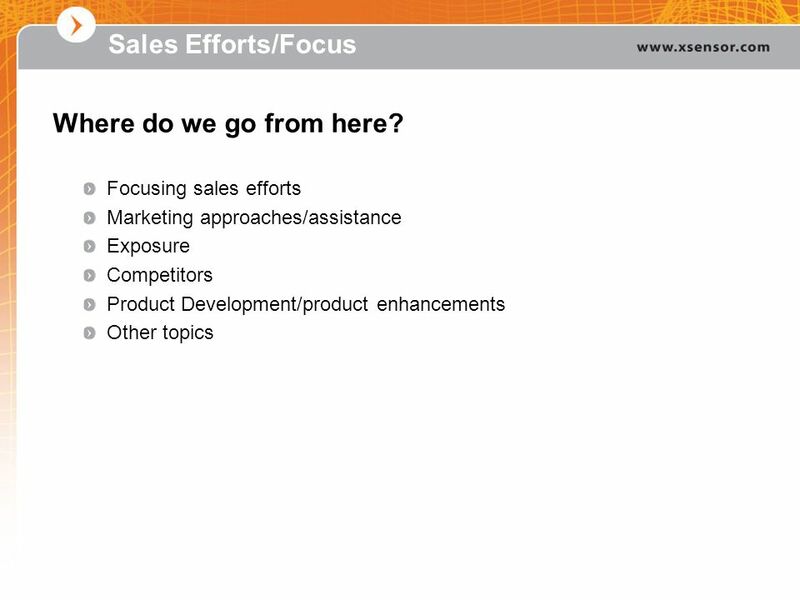 Business history with Toyota Group Companies – No. 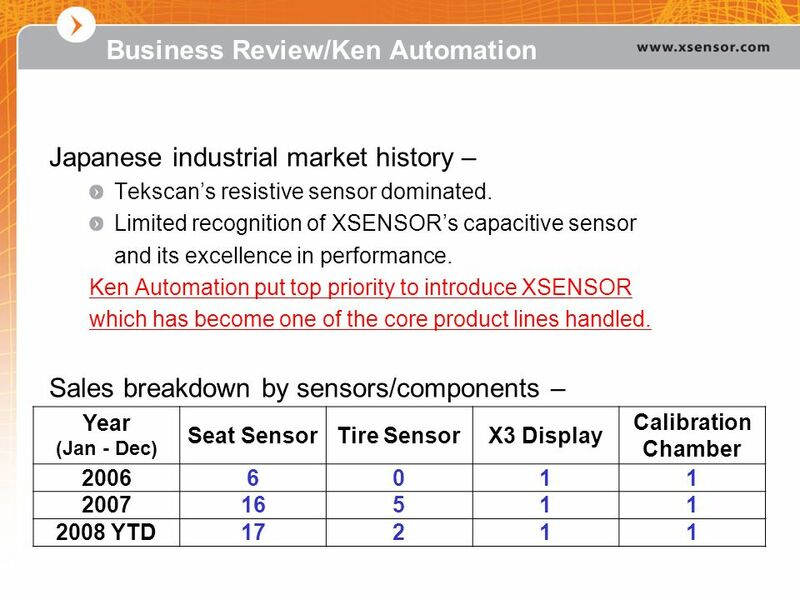 Date Group Company Initial Contact Status Application Remark 1 2006/11 Aisin Trade show Shipped Bed 2 2007/6 Denso Web site Lost OEM seat sensor 3 2007/7 Toyota Motor Automotive seat 4 2007/8 Recommended by No.1 Power window Required more than 200 PSI -> Maybe PPS 5 2007/10 Polishing car body -> Maybe Tekscan 6 Under study Rubber bushing Competitor is Tekscan 7 2007/12 Toyota Central R&D Advertisement 8 2008/1 9 Toyota Boshoku Trading company 10 2008/3 Daihatsu Shipping Deliver in this month 11 12 2008/8 Recommended by No.3 Seat belt Pressure level is very low. 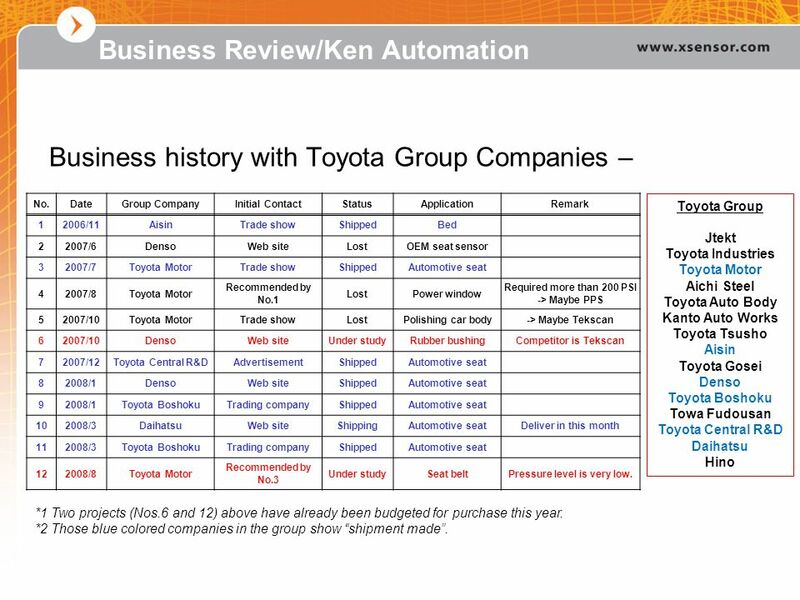 Toyota Group Jtekt Toyota Industries Toyota Motor Aichi Steel Toyota Auto Body Kanto Auto Works Toyota Tsusho Aisin Toyota Gosei Denso Toyota Boshoku Towa Fudousan Toyota Central R&D Daihatsu Hino *1 Two projects (Nos.6 and 12) above have already been budgeted for purchase this year. 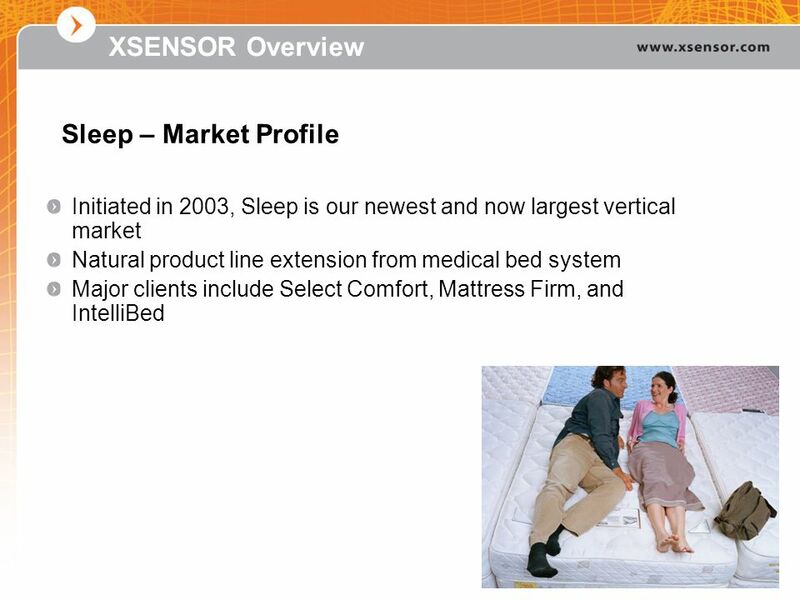 *2 Those blue colored companies in the group show “shipment made”. 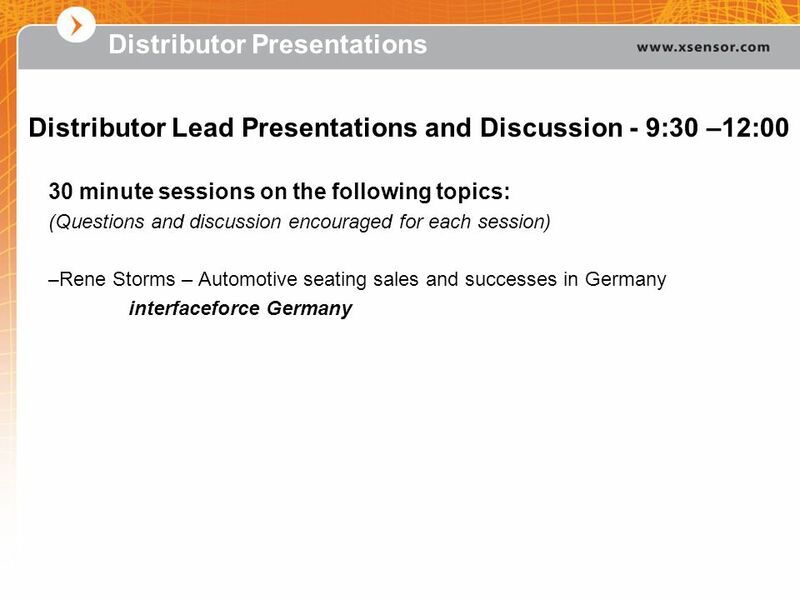 Download ppt "Automotive Testing International Distributor Training"
Doing Business In China Building value for foreign enterprises in Asia. 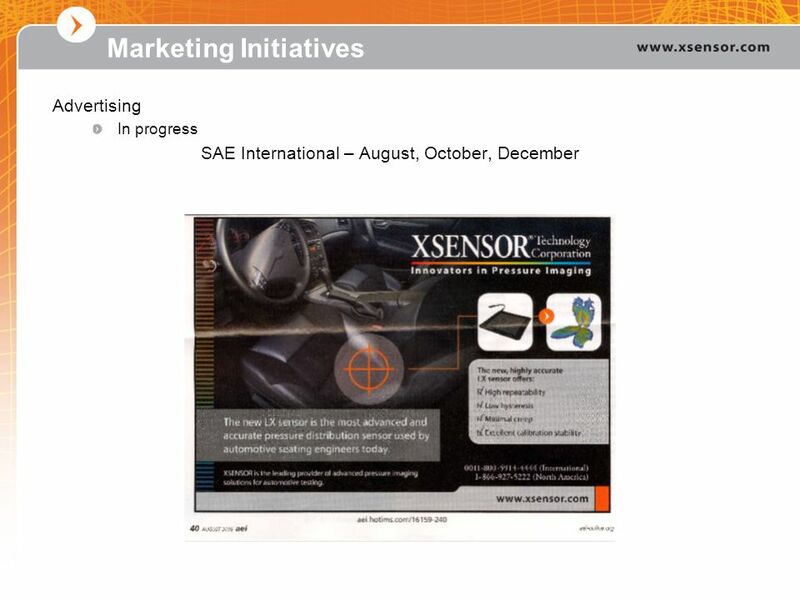 Neil Perry Vice President iMedia Communications Insight Presentation: Behavioral Targeting. 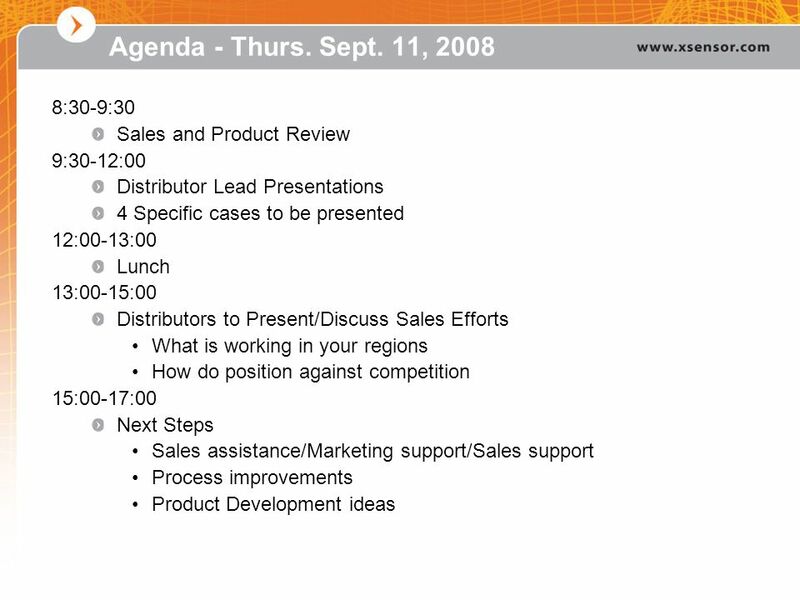 Solid Waste Management Coordinating Board Solid Waste Management Coordinating Board Regional/County Solid Waste Master Plan Update June 22, 2011. 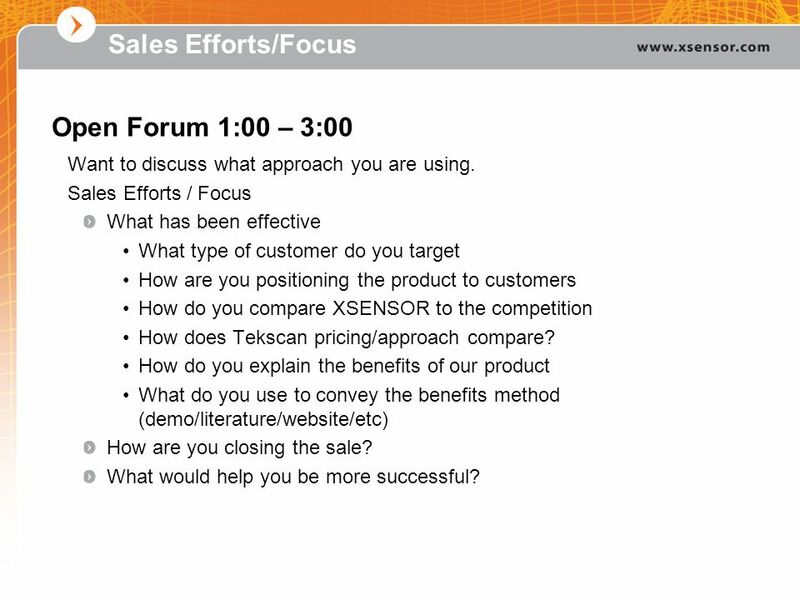 Defining and Penetrating NEW Markets Canby Industrial Forum OREGON MANUFACTURING EXTENSION PARTNERSHIP Prepared by: Heather Cutler 02/19/2014.